This is my #1 spot because you spend significant time here every day – create a space that is functional and enjoyable! BONUS: This is a BIG item on a home shopper’s list, so you can be confident that this investment will up the resale value of your home! This is another area of your home you will use multiple times a day – staying organized and prepared in the kitchen saves headache and hassle. Let’s design a pantry that makes cooking fun! Do you dread walking out into your garage, tripping over bike helmets and garden shears? Do you close the garage door as quickly as possible to spare your neighbors from a peek inside? 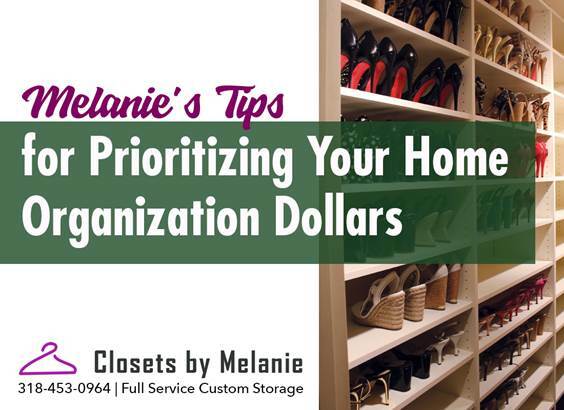 Make your garage work for you with some organizational tools! We can give everything a place, saving you the mess and stress. Laundry rooms have recently begun to receive a lot of attention in the design world, and for good reason! There are many great storage options and design tools that can make your laundry room more practical and more appealing.